It’s hard to believe this is the first item I’ve knitted for my daughter since she was born almost 16 months ago, but she grew so damn fast and I had so little time! But I have finally rectified the situation with a little cardigan, that will hopefully last her into next year. Back in February, after reading Kate Weston of Hilltop Cloud’s wonderful book, I was inspired to try fractal spinning with a ‘Highlighter’ gradient batt from Spin City. Fractal spinning involves splitting fibre (typically a braid) in half lengthways, and spinning one half as is, then further splitting the other half into two or more strips before spinning and plying with the other half. 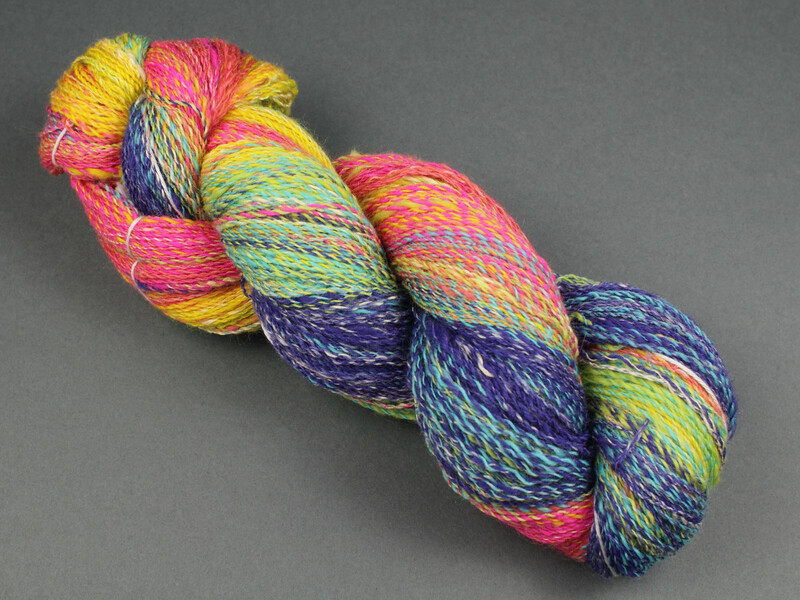 When done with a gradient braid, the resulting yarn has two separate gradients running through it. It’s kind of hard to explain in words but the effect is beautiful, and ideal if you want a marled yarn with smaller sections of individual colours than you would get spinning end-to-end. Splitting the gradient batt this way was a little more difficult than it would have been with a braid but was well worth it. I went for a 1:3 fractal, i.e. I split the second half into three further sections before spinning, having the gradient repeat three times vs once in the other ply. The resulting yarn was very beautiful, but definitely leaves the knitter guessing about how the finished fabric will look! 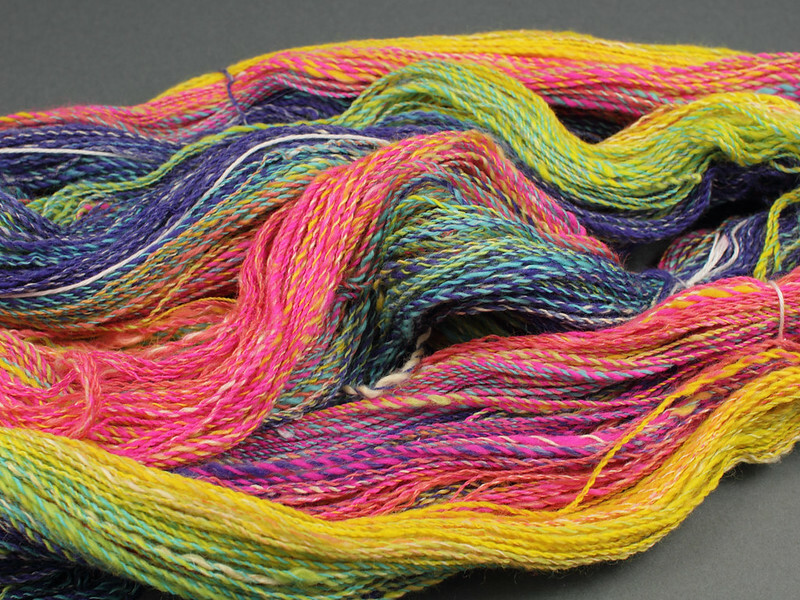 The main and secondary gradients were more visible once the yarn was wound into a cake. The pattern was Pacific Coast by Gabrielle Danskknit. It’s a basic top-down raglan, but it’s nice to have someone else do the maths! 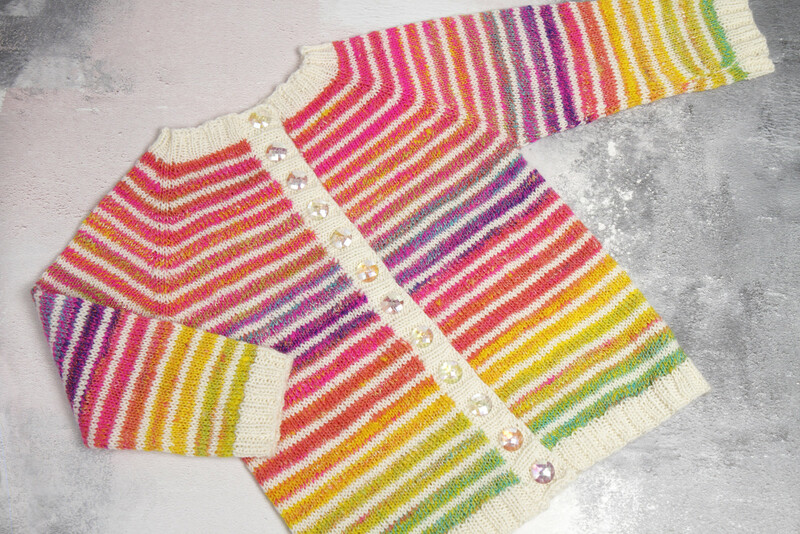 The pattern has a wide range of sizing from newborn to 10 years, making it a good investment for anyone knitting for rapidly-growing small people. I used the 2-year-old size but I found it to be a bit small so I carried on the yoke increases for a few more rows than specified (though I could well have read the pattern wrong because I am a sleep-deprived parent afterall). The multi-gradient effect is revealed. But for the first time in my knitting life, I am disappointed that the cardigan only used half the skein because I can’t see the full gradient! The contrast yarn is our undyed Favourite Sock merino 4 ply, which I find myself using in its natural form all the time. 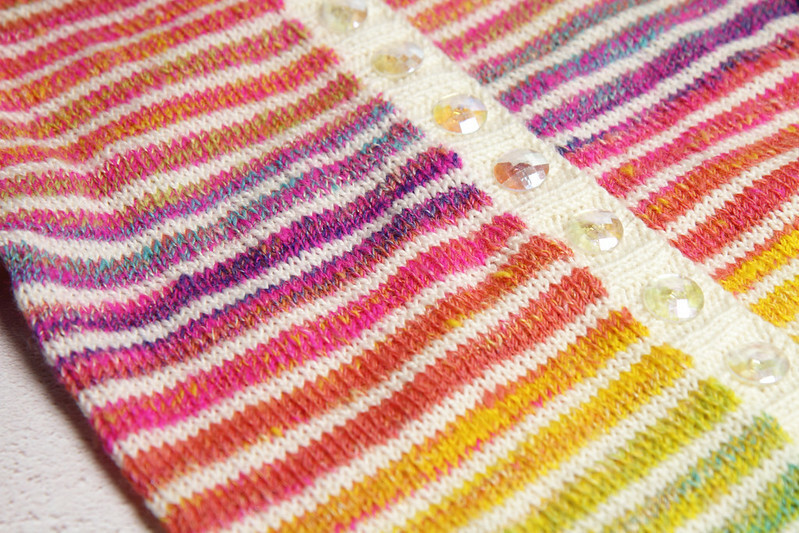 It makes such a lovely fabric that evens-out my “lively” handspun perfectly. To maintain the gradient after dividing the sleeves, I worked eight rows of colour on each sleeve and the body in turn. This gave me a lot of ends to weave in but was worth it. I worked the sleeves and seamed them to avoid “jogs” in the stripes (I didn’t want to keep track of jogless joins working such small sections at a time on each). I love the marled effect given by the fractal-spun yarn. I am surprised how much the main gradient (from the end-to-end) ply dominates the effect and I wonder if this is a feature of fractal spinning or a result of me having perhaps spun the first ply a little thicker? I found the button choice quite tricky. 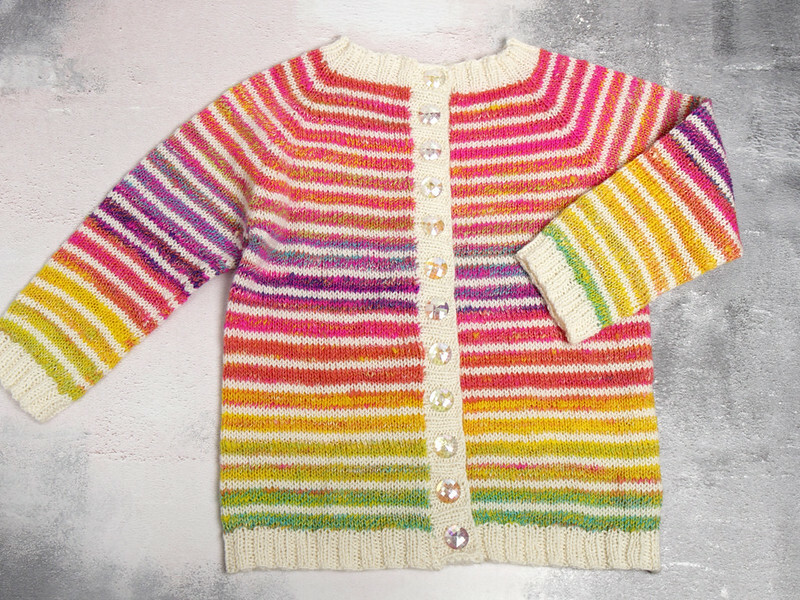 There is so much going on, I didn’t want to detract from the pattern, and the rainbow buttons I picked out didn’t look right at all. With a closely-spaced row of buttons I think a shanked button looks nicer, as the sewing holes can add ‘busyness’, but a simple domed, shanked button in the right size proved elusive. The faceted, translucent, iridescent buttons I chose echo the rainbow shades in a subtle way and add a tiny bit of sparkle. 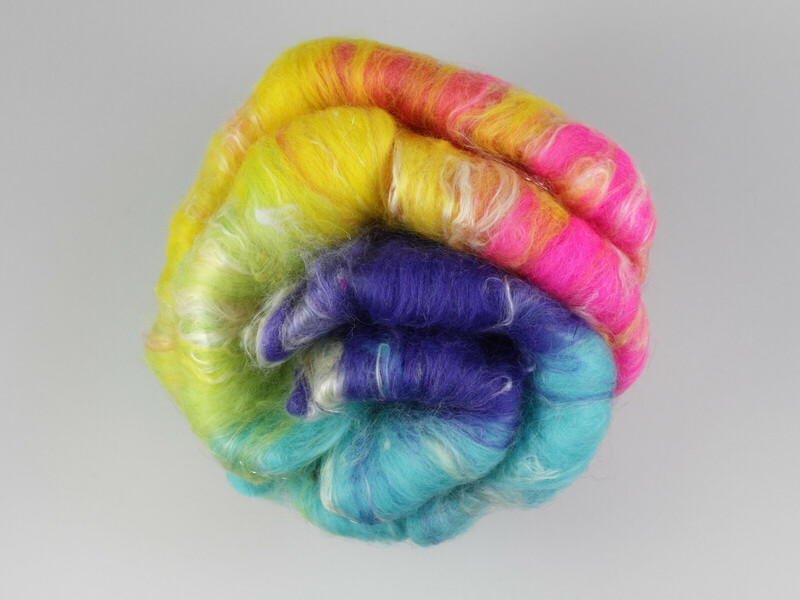 I am now a bit obsessed with fractal spinning, and you might have noticed that I have been dyeing gradient braids for the shop, like this neon rainbow number, like crazy (well, as fast as I can, I’m very limited by drying space for fibre). I would love to see your gradient and fractal spins – please share in the comments! We’re exhibiting at Yarnporium 2018!